A stove that has been tested and certified as meeting a safety standard has a label on the back showing how much clearance is needed from combustible material like walls and furniture. This information is also found in the manufacturer's installation instructions. If there is no label, the stove is not certified. Please note: The clearances provided here are for Canada. Each country, and sometimes jurisdictions within countries, have their own rules. If you don't have access to a code and no wood heat dealer or inspection agency or insurance company to provide advice, use these figures for safety. Otherwise, use the clearances enforced by code locally. Almost all new wood stoves currently offered for sale have been safety certified and most insurance companies will only accept certified appliances. Stoves that are not tested and certified include used or antique stoves or stoves that have been built by small, informal welding shops. It is a good idea to avoid uncertified stoves for serious heating because their safety and efficiency are likely to be inferior and many insurance companies refuse to cover houses containing them. Also, because they have not been tested, their performance is unknown, so the minimum required clearances to combustible material are very large: 1200 mm (48 in.) for radiant stoves and 900 mm (36 in.) for stoves surrounded by jackets behind which convection air can flow. The clearance for an uncertified radiant stove is 1200 mm (48 in.) and for a stove with a sheet metal jacket or casing the clearance is 900 mm (36 in.). The clearances are large because they apply to all shapes, sizes and designs of stoves that have not been tested to determine the actual clearances. * Shielding consists of protection such as external jacketing or metal heat shield attached to the sides and rear of the appliance and spaced out at least 50 mm (2 in.) by non-combustible spacers, with provision for air circulation at bottom and top. Clearances are measured from the outer surface of the appliance to the combustible material. We all want our wood stove installation to take up as little floor space as possible, so the reduction of minimum clearances using special shields is common. The clearances for both certified and uncertified stoves can be reduced safely using the rules set out below. 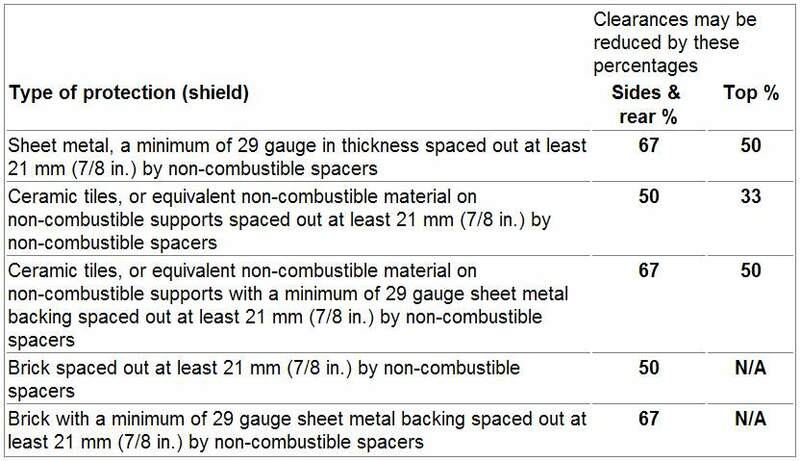 The common feature of the clearance reduction rules is the air space behind the shield material. This space sets up a convection flow of air as the stove is operating and prevents most of the stove's heat from reaching the wall behind. The percentage indicated in the table is the amount that the minimum clearance may be reduced with the particular shield system listed. Both wall and ceiling clearances may be reduced using shields. A variety of materials can be used for clearance-reducing shields, from simple sheet metal to more decorative shields using brick, stone slices or ceramic tiles. Shields must be permanently mounted to walls. Free-standing, folding panels should not be used as shields. Minimum space between shield and combustibles: 21 mm (7/8 in.). Minimum clearance along the bottom of shield: 25 mm (1 in.). Maximum clearance along the bottom of shield: 75 mm (3 in.). Minimum clearance along the top of shield at ceiling: 75 mm (3 in.). Shield extension beyond each side of appliance: 450 mm (18 in.). Shield extension above appliance: 500 mm (20 in.). Edge clearance for ceiling shields: 75 mm (3 in.). Adhesives used in shield construction must not ignite or lose adhesive qualities at temperatures likely to be encountered. Mounting hardware must allow full vertical ventilation. Mounting hardware must not be located closer than 200 mm (8 in.) from the vertical centre line of the appliance. Mounting hardware which extends from the shield surface into combustibles may be used only at the lateral extremities of the shield. Details of a wall shield By allowing air to flow between the shield and the combustible surface, a wall shielding assembly can be used to safely reduce minimum clearances. The shield is required to extend at least 500 mm (20 in.) above the top of the appliance and 450 mm (18 in.) beyond each edge of the appliance.Commercial shields are also available for the reduction of minimum clearances. These shields are subjected to a series of tests to determine how effectively they can reduce clearances. They are certified and carry a label which confirms that they have met the tests and provides information on clearance reduction details. Some of these commercial shields are designed so that they can be attached directly to combustible walls without the need for an air space. The first step in reducing clearances is to determine the minimum clearance, either from the appliance label or from the table of clearances for uncertified appliances. Then, calculate the permissible clearance reduction for the type of shield you plan to use from the table on clearance reduction. The channel spacers shown are the most effective type to use because they give good support to the shield and do not transmit heat through the mounting hardware to the combustible wall. Metal wall strapping, available from most building supply stores, is made of light steel channels that work well as shield spacers. Note that the bottom of the channel is notched to allow cool air to enter. The shield must extend 450 mm (18 in.) beyond each edge of the appliance and 500 mm (20 in.) above the top of the appliance. Wood stoves that are certified as meeting the safety test standard will not overheat a combustible floor. During testing, the floor temperature is checked and must not exceed safe limits. Although the floor will not overheat due to stove operation, the floor must be protected from live embers that might fall from the stove during fire tending or ash removal. The floor pad must be made of a durable, noncombustible material, such as sheet metal, grouted ceramic tile, or mortared brick. Floor pads must normally extend not less than 450 mm (18 in.) in front of the loading door and 200 mm (8 in.) beyond the other sides and back. Floor pads must not be installed on carpet unless the pad is structurally supported so that it does not move or distort. The floor pad protects flooring from hot embers that might fall from the appliance during fuel loading or servicing. The pad should extend at least 200 mm (8 in.) beyond the sides and rear and 450 mm (18 in.) in front of the loading door. The floor pad must be a continuous, non-combustible surface. The floor pad must not rest on the carpet unless it is strong enough to resist bending or cracking. The best floor pads are laid on the sub-floor so that their finished level is flush to the floor, so there is no edge to trip on. Uncertified stoves have not passed safety tests, so heat from the bottom may overheat floors. The rules for floor protection for uncertified appliances are complicated, with several different types depending on how high the legs support the stove from the floor. If you are installing an uncertified appliance, you should contact a qualified professional for details.